Gucci (left) claims Forever 21's designs (right) are similar to its own, leading to a trademark dispute in the California judicial system. At first blush, the case against Forever 21 seems like a slam-dunk for Gucci – it owns several federal registrations for the three-stripe designs. And Forever 21’s use on clothing items appear quite similar. Is there more to the case than meets the eye? Start with the basics. A trademark is a more limited right than a copyright or design patent. It is merely the right to use a particular word or symbol to identify the source of goods. Someone who adopts a similar word or similar design that confuses the consuming public infringes that right. In the absence of confusion, however, there is no infringement. In a trademark case, consumer perception is paramount – what do consumers think when they see the mark on the trademark owner’s own product? Are they confused when they see a similar mark on the accused infringer’s product? This creates many issues, particularly in a case like the Gucci-Forever 21 case where the claimed mark is also a decorative design. 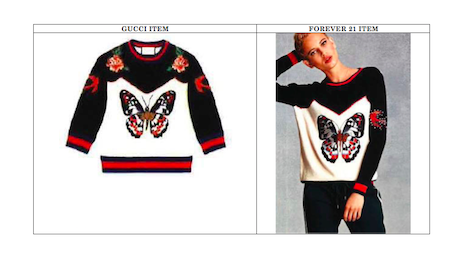 Gucci's butterfly pattern (left) on its sweater versus Forever 21's butterfly design (right). Function As A Mark – Does the public perceive Gucci’s marks when viewed on Gucci’s goods as trademarks – identifiers of source, i.e., Gucci – or merely as decorative designs. Trademark applications are routinely rejected precisely on this ground. Secondary Meaning – Where a trademark is the design of a product itself (also known as trade dress), the trademark owner must show that the design has acquired recognition in the target customer group as representing a single source for the goods. Aesthetic Functionality– Forever 21 has asserted that Gucci’s marks are “aesthetically functional,” a legal doctrine that would invalidate Gucci’s trademark rights. But “aesthetically functional” means more than the mark is pleasing to the eye. Forever 21 would have to show that there is some competitive need for others manufacturing and selling the same type of items to use that mark. Usually this involves some need to match other popular designs in the industry. Obviously, many clothing items can be and are sold without these stripe designs. Perhaps Forever 21 plans to argue that the use of such a striped theme is currently a hot style, and it needs to use these color stripes to offer the latest fashions. These issues concern whether Gucci can show that Forever 21’s use of these designs are likely to confuse the consuming public. Perception Of Design As A Mark – The biggest hurdle Gucci faces is showing that Forever 21’s customers viewing Forever 21’s items would regard the stripe designs as trademarks at all – rather than simply as decorative designs. Unlike a label or small brand designation, these designs encompass a large part of each item sold by Forever 21. Consumers generally do not view these as trademarks but merely design features. Unless someone views that as unique to Gucci, then it is hard to see how there is any confusion. Point Of Sale Circumstances – Forever 21 sells its items in its own stores and on its website, featuring its house mark, Forever 21. The items appear to be branded with its own name – and they are sold at prices way cheaper than Gucci’s. The word Gucci is never mentioned. In assessing likelihood of confusion in an infringement case, a court must look at the totality of the circumstances of the sale. It is hard to believe that Forever 21’s direct customers believe they are purchasing a Gucci product. Post Sale Confusion– Likely a stronger infringement theory for Gucci is “post sale confusion.” Courts recognize that sometimes the real confusion is not the immediate customer, but others who see a customer wearing the item and are confused into believing it is a luxury brand item. Gucci will likely argue that Forever 21’s clothing items create just such a type of confusion. Forever 21’s Bad Faith – If it can be shown that Forever 21 acted in bad faith – intending to cause confusion and take a free ride off Gucci’s reputation – then that would go a long way to establishing infringement. Gucci’s counterclaims tout that Forever 21 is a frequent litigant, accused in many cases of infringing luxury brands’ IP rights. 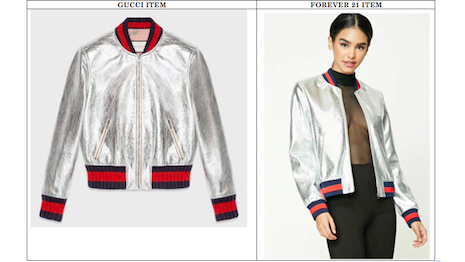 Another factor implicit in Gucci’s papers is that many of the items Forever 21 is selling bear designs very similar to Gucci’s, even beyond copying the “webbing” three-stripe marks. No IP rights are asserted in these designs, and by itself this likely means little. But when the whole collection is viewed, including use of the registered stripe marks, one gets the distinct impression that Forever 21 is attempting to lift wholesale Gucci’s line. Even if that is not itself an infringement, it could evidence Forever 21’s bad faith. Gucci has also asserted the theory of trademark “dilution” under both federal and state law. Dilution is a means by which a trademark owner can attack a use of its mark by someone else even where there is no confusion. Dilution By Blurring- Dilution classically involves use of a term or symbol as a trademark. In the Gucci – Forever 21 case, however, Forever 21, arguably, is using Gucci’s marks in a decorative way, not as a trademark. Does that support a dilution claim? There is little direct law on that issue. An analogous situation is where someone uses a word mark as a generic term, not as a trademark. A few courts have allowed such a theory, but most courts and legal authorities do not. And in fact the language of both the federal and California dilution statutes suggest that the defendant has to use the word or symbol as a mark. Gucci's sweater (left) contrasted with Forever 21's sweater (right). What on the surface may seem like a simple case of trademark infringement often in reality presents layers of complexity. Most of this complexity stems from the fact that trademark rights are not the right to exclude others from use of a word or symbol, but the right to prevent consumer confusion or deception. In any trademark case, the bottom line question is who is being confused and how? The Gucci-Forever 21 case will likely illustrate how these layers play out in a real-life case.